Eleven bookstores in Beijing will stay open overnight this summer, offering cool refuge and knowledge to readers who are off work or together with family. On Thursday, the Xiangshan Xinhua Bookstore unveiled the Summer Reading Nights series of events including a reading performance as well as a mini session on nature at the store. In August, the city's 11 24-hour bookstores will invite writers and professionals to talk about a wide range of topics on nature at night. Some of the bookstores will offer 24-hour art/illustration exhibitions to readers for free. "It's also a chance to declare the existence of those 24-hour bookstores in Beijing. Now more than 10 of them are there to promote the habit of reading and offer more cultural services to readers," said Wang Yijun, an official with Beijing Municipal Bureau of Press, Publication, Film, Radio and Television, which sees to the Beijing Reading Festival project. 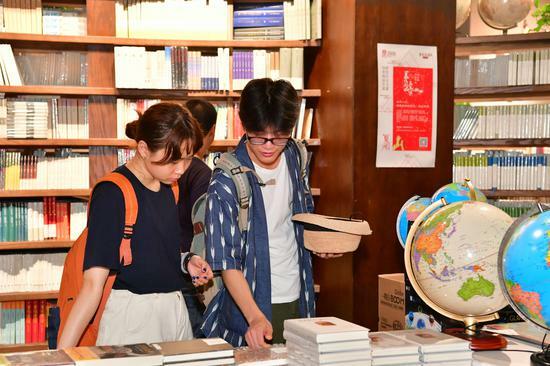 In mid-July, the Beijing government announced new incentives for bookstores in which 50 million yuan ($7.3 million) will be used to support more than 150 bookstores for their management and organization of cultural events. The new incentives are expected to help more bookstores that have longer business hours, more culturally creative products, and locations neighboring residential communities thrive in the city. Known for its collection of ancient books and secondhand books. Has a collection of 15,000 titles among nightlife hubs. Eleven bookstores in Beijing will stay open overnight this summer, offering cool refuge and knowledge to readers.